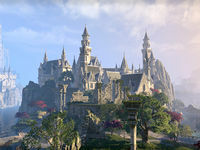 Lillandril is a town found in the northwest part of Summerset. 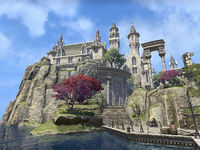 It is home to the rivaling College of Sapiarchs and the local chapter of the Mages Guild. A strange murder of a Sapiarch has taken place and your help is needed to investigate the mystery. Lillandril Objective: Investigate the strange murder of a Sapiarch in Lillandril. 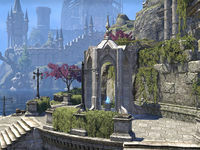 The Lillandril Wayshrine is located at the docks, in the southern part of the city. Quen mentions attending the Illumination Academy in the city, and her Meet the Character is a letter addressed from Tundellde, an Intendent writing about her expulsion. The game meanwhile depicts the Illumination Academy as quite a way east from the town. Lillandril previously appeared in Arena.